Travelling the world and learning all the local dances is kind-of my dream.. so when Karlos and the team from The Traveling Dancer asked me to help them make the most of their time in Cartagena I jumped (and shimmied and fist-pumped) at the opportunity. This episode is all about Cartagena and I am obviously biased but I think it is super cool. 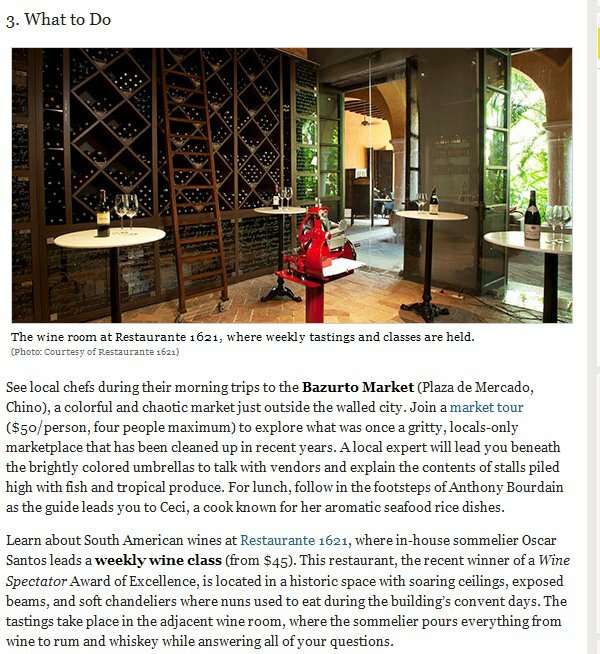 Travel + Leisure know what's up! 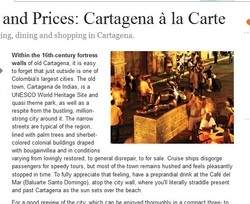 First of all for even compiling a list of the world's best street food cities (respect), then for including Cartagena and finally, and, for obviously biased reasons, most importantly, for naming Cartagena Connections Street Food tour as one of the very best ways to experience all the fried goodness! ​Annie Merkley is one cool cat. 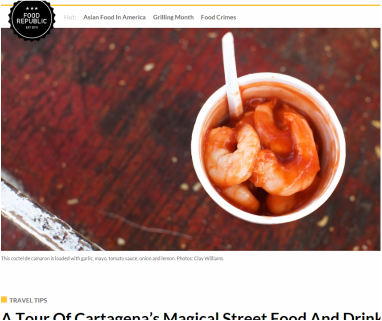 She plays the banjo, she travels the world, she writes for all the most street-credible publications.. and here she is, singing the praises of our Cartagena Connections street food tour on Paste magazine. Don't we feel special? Yes we do. Not meaning to gloat, but I really love my job. Some days for example, I get to hangout with cool people, eating food and talking about all my favourite things about said food.. and then it turns out those cool people write a lovely piece for Food Republic and make reference to me and expertise in the same sentence. Conde Nast has quickly skyrocketed to the top of our preferred publications after charming editor David Jeffreys described Kristy as both "affable" and "vivacious". I was actually in the Mercado Bazurto drinking a Lulo juice when a tiny shrunken man thrust the Sunday edition of newspaper El Universal under my nose and demanded, "Eres tu?!" Yup. There I was, in an almost life-size photo, mounting my trusty orange bicycle Nemo, under the title, "Una australiana 'champetua'". If you want to try your hand at Spanish, you can read the full article ﻿here﻿. 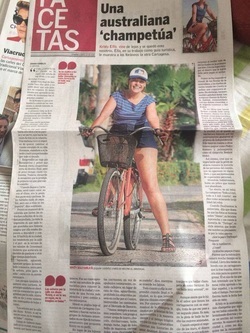 Basically, the lovely journalist Johana Corrales talks about this strange Australian girl who loves Cartagena so much she is "more Cartagenera than anyone" - she knows the dances, the food, the local sayings and she's now sharing all this love and knowledge with tourists who want an insight into daily life here. Want to know what a 'champetua' is? Book a tour with Kristy! Here I am, all giant again, and riding Nemo-the-orange-bicycle.. This time I was helping out a campaign to attract more visitors from New York. No payment was received, but/so I'm fishing majorly for a free jetBlue flight. Please, pretty please jetBlue! 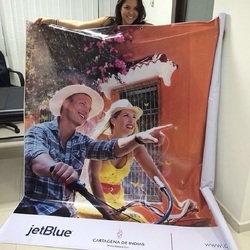 I think the campaign worked.. those New York - Cartagena jetBlue flights seem pretty darn full. If anyone knows anyone at jetBlue and can put in a good word that would be tops! 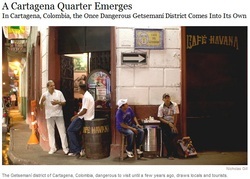 COLOMBIA TRAVEL's cartagena campaign is magico!